How about this – two new articles in one day! 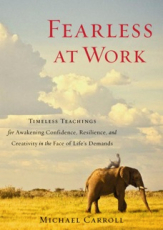 I can’t tell you how much I enjoyed Michael Carroll’s book “Fearless at Work”. While I had hoped I would enjoy it since Carroll is a teacher in the Shambhala lineage I study, I was overwhelmed by ideas and inspiration after reading his book. I love it when someone takes the next step in how to apply old teachings to modern situations. This is NOT a “been there, done that” book – this really is fresh! Yes, I am intentionally not telling more because I want you to get this book. Put it on your Christmas list. Beg someone to buy it for you. Or leave a comment here and win a copy! In my review I tell the story of how I finished it on a Sunday nite and by Monday morning I got a chance to use what I had learned. Carroll celebrates our own inner wisdom which can be accessed at any time. He doesn’t give formulas for more productivity or how to run a better project team. Instead, he says that we all actually want to feel confident, more than anything else, at work. Go here to read more about how to become confident and defenseless at the office!